Those of you who are regular readers of my blog will know that I really need routine. And part of that routine has been writing down my recipes every night. I used to keep a food diary and it evolved with this blog to a recipe diary. I am so far behind in putting the recipes from my notes onto my blog that I have in fact stopped jotting down recipes every night. This has been quite liberating as I can just cook comfort food. And, Dave is also cooking which has been wonderful for me. It has been a mini time out. With that in mind, I will share with you the fact that I made this dish for Gorgonzola mushrooms on the 25th of February! My mid year sojourn will at least mean that sometime in the near future I will be blogging ‘current recipes’ and not ones that appear to be out of season, or with photographs taken in haste. These look absolutely delicious, right up my alley! These look divine Tandy. I am always looking for new ideas to serve up (disguise):) veggies for the kids. I am going to try this one on them. As for Dave and I, we love anything with gorgonzola. Delicious. PS. I always love reading your blog. These look really good… what’s not to like? 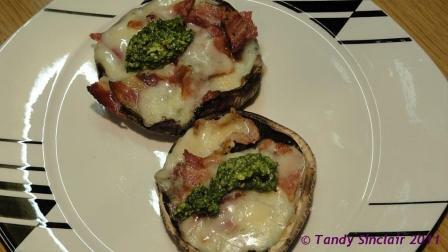 mushrooms, bacon and gorgonzola…mmmm! wow im hungry now this looks awesome! Lovely – delicious in February or July….or any month at all in fact! Absolutely yummy, Tandy. Thanks for the idea. No matter how they are photographed, they are delicious! Throw a hunk of meat on the side and Pete will be in heaven. I love these mushrooms especially filled with cheese – yummy! Enjoy the day! Do you have any idea how long a bottle of pesto will keep for once opened? I always tend to end up throwing mine away which is such a waste.. I love Gorgonzola cheese, its bought in Italia also with a fresh mix of marscapone. Creamy Deluxe! These look delicious and I love the added ingredient of pesto. Buono! thanks Yvette – I love the creamy version as well! I just love these, but Alan finds them too rich, so I reserve them for cooking when he’s away on business.